Nanosecond lasers emit a laser beam with high peak power at an ultra-short nanosecond-pulse duration and have been widely used for tattoo removals. However, lasers with a picosecond-pulse duration are more advantageous to the selective breakdown of tattoo particles, since the sizes of tattoo pigment particles generally range from 10–100 nm and show a thermal relaxation time of 0.1–10 nsec. Furthermore, in vivo and in vitro experiments suggest that, due to recent technological advances, picosecond-domain lasers are safer and more effective for use in tattoo removal. Quanta pico plus is the first picosecond laser to include a Ruby 694nm wavelength. This provides a serious advantage over previous generation laser systems. Thanks to Ruby 694nm wavelength we can remove notoriously hard to treat light blue and green pigments. One more specification this high-end laser system posses is 1.8GW peak power. Unlike other systems, this ultrahigh specification is needed to be able to achieve optimum photomechanical effect. This basically increases the speed at which the laser shatters tattoo pigment particles which ultimately leads to lesser treatments needed to successfully achieve complete tattoo removal. Quanta Discovery Pico Plus includes QUATTROPULSE™ TECHNOLOGY – which in translation means four separate emission modes. This provides the laser technician with high versatility in tattoo removal treatment options. On the image to the left you can see the difference between Q-switched and picosecond laser system, and their effect on the tattoo ink. Nanosecond laser systems rely on photothermal energy to shatter the tattoo ink, however Quanta pico plus besides this also utilizes photomechanical effect of picosecond laser, for more difficult tattoos, achieving safer and more effective tattoo removal results. At Think Again Laser Clinic we are results driven, which is why we have chosen to use a Quanta Discovery Pico Laser System for our tattoo removal treatments. This world’s best high performing and superior laser manufactured by Quanta System from Milan, Italy and has been developed to treat and remove all tattoo colours using just one device and represents the real benchmark for the Q-switch laser market. 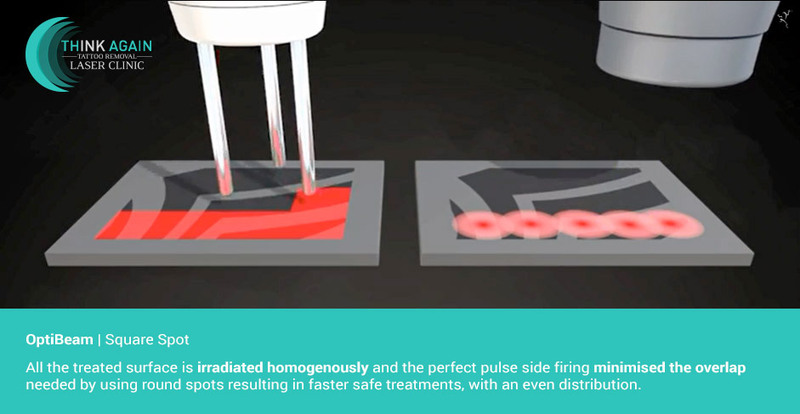 Delivering powerful, extremely short laser pulses of various wavelengths guarantees the procedure to directly target the various ink particles in a short and safe procedure. The squared Opti-Beam handpieces ensure the laser energy is perfectly distributed over the spot area and delivering the energy consistently preventing any excessive overlap pulses. Other laser machines may use a round spot that will cause “hot points” that can produce bleeding, skin texture changes and hypo-pigmentation. Our laser also has a flat top beam profile which penetrates the skin evenly. Other lasers are likely to have a spiked beam profile which will cause a higher risk of burning, blistering and hyperpigmentation. Extremely short nanosecond bursts of light energy penetrate the skin through the tattoo ink pigment leaving surrounding skin untouched. The laser passes beneath the first layer of the skin into the dermis (the second layer) where the ink molecules absorb the laser energy and are shattered into smaller pieces that are then absorbed into the blood stream. The body will then begin the process of harmlessly removing the ink through the lymphatic system which will take a minimum of 6 weeks for the process to be successful. Each treatment will continue to target the tattoo ink pigment, each time shattering into smaller microscopic pieces eventually dissipating and allowing no visible particles. Just like the sun is attracted to a black t-shirt yet reflects a white one, the surrounding skin with no tattoo pigment will simply reflect the laser and remain unaffected. During treatment the tattoo will appear to have a white surface layer which is the first initial sign that the process is working. This is caused by the breaking down of tattoo pigment and the reaction to the laser, this colouring will subside within a couple of hours. Immediately after treatment the surrounding skin is likely to show a red discoloration and mild swelling. The feeling can be compared to mild sunburn where swelling and redness may last for one week. We will continue to cool the area at minus 40℃ using our optimised skin cooling machine.